It’s all the charm of the Fan in 1911 with all the desired 2019 upgrades! From the front door all the way to the fabulous walled garden, every inch of this property has been lovingly restored. A double parlor in the front of the home has functioning gas coal fireplaces with the original mantles- and one with the original tile surround. The southern exposure allows the sunlight to stream through all the new windows upstairs and down..and over the refinished original hardwood floors. Bathrooms on both levels have been completely updated- beautiful finishes with marble, quartz and top notch plumbing fixtures. Antique lighting fixtures in keeping with the period of the home are throughout the hallways- rewired and polished to perfection. Creative sellers closed in a rear staircase to create more closet space upstairs (however, leaving in a way that future owners could reopen if wanted), carved more storage from under stairwells, and in the hallways. There is little to do here other than move in and enjoy the peaceful garden- a fully enclosed courtyard complete with raised beds, fountain, brick patio, irrigation and stunning plantings. This one will stop your search-Fabulous! 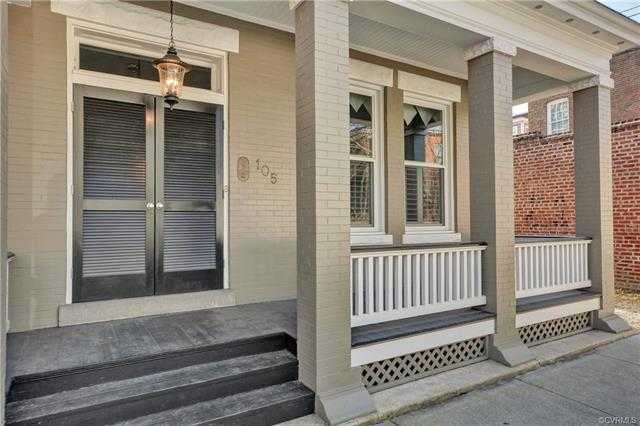 Please, send me more information on this property: MLS# 1909602 – $590,000 – 105 N Rowland Street, Richmond, VA 23220. I would like to schedule a showing appointment for this property: MLS# 1909602 – $590,000 – 105 N Rowland Street, Richmond, VA 23220.